There are TWO maps enclosed at the bottom of this page. 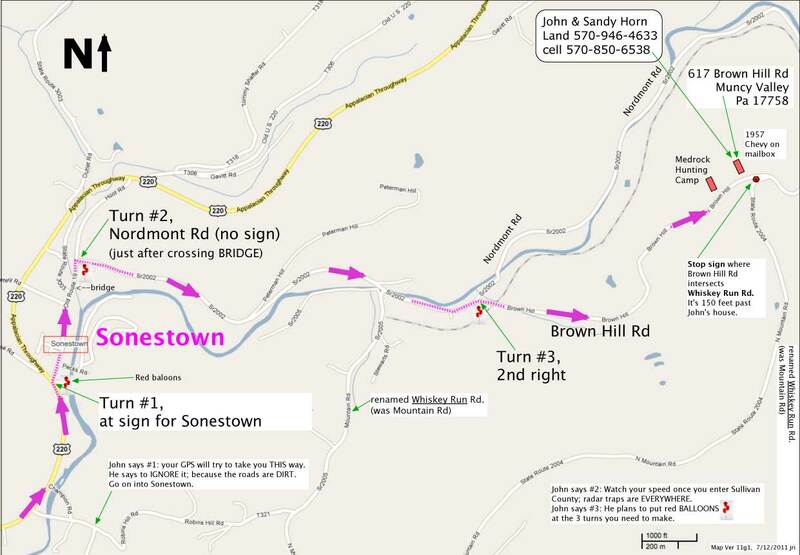 The 1st attached map shows the location of John Horn's house in Muncy Valley (mailing address). It's actual location is a couple of miles East and slightly North of Sonestown. A. Watch your speed once you enter Sullivan County; radar traps are EVERYWHERE. 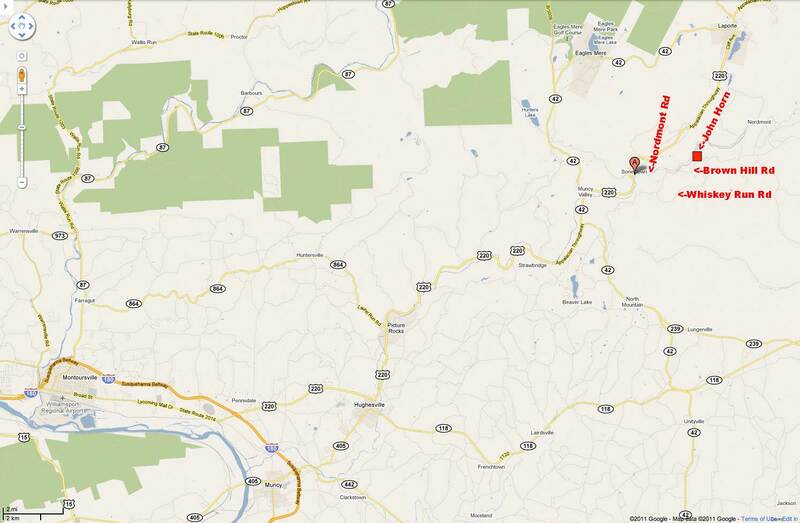 B. John says your GPS will try to have you turn off Rt 220 BEFORE you get to Sonestown, and take you onto Champion Road, which will take you on some DIRT roads. He says to IGNORE your GPS and continue on into Sonestown, as the map shows. #3) the right turn onto Brown Hill Road. He thinks the sign identifying Nordmont Road (turn #2) is gone, so this turn may not be marked. But it's the first right turn after you cross the BRIDGE on "Old Rt. 19/? ?Hoot Road", and if you miss the turn, you'll find yourself coming out to Rt. 220 again. D. Once you're on Brown Hill Road, you will drive about a mile. You will pass the Med Rock Hunting Club on the left (it has a sign) just before you come to John's house on the left. John's house is #617 Brown Hill, and it has a 1957 Chevy on the mailbox. E. If you MISS John's house, then about 150 feet PAST his house, you will come to the stop sign where Brown Hill Rd intersects Whiskey Run Rd. F. John says that the road that shows on the maps as "Mountain Road" and "North Mountain Road" has been renamed to "Whiskey Run Road". He says there was a second "Mountain Road on the other side of Rt 42, so they renamed the one near him. All the above comments are included on the attached Map #1, just a little less verbose. G. Note that none of the online maps seem to show John's location accurately. I think this drawing is pretty close to correct, as I talked with John over the phone about it. The 2nd attached map shows you the overall area. Note if you're travelling north on Rt. 220 from Hughesville, and you find yourself arriving in LaPorte . . then you somehow missed the turn to Sonestown, as Laporte is the next town north of Sonestown. Directions are as follows: From Williamsport--220 north to Sonestown. Go through town and make a right on Nordmont. Go to second right (Brown Hill Rd.). 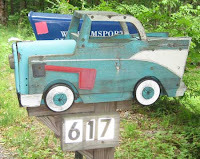 Go 1 mile to house on left at 617 Brown Hill with the 57 Chevy mailbox. If you get lost, call John at 570-946-4633. When he or Sandy answers, just yell "Help"! to Sonestown and follow above directions. markers and balloons from Sonestown to the Horn residence.